Architects Robertson Simmons Architects Inc. Interior Designer Elemental Interior Design Inc.
Project Description Enermodal Engineering is Canada’s largest green building consulting firm and provides a full spectrum of sustainable building services, from LEED consulting through commissioning and green education services. Enermodal had high objectives during the design stage of its 21,000 s. f. office, to create a healthy work environment for its employees in a building that uses less energy than any other office in Canada. Its new headquarters is a model of sustainability set to become the first triple LEED Platinum office, aiming for certifications in New Construction, Commercial Interiors and Existing Buildings/Operations and Maintenance. Design Intent Besides the building’s sustainability, one of the ultimate goals of the project was to control solar heat gain and reduce heat/cooling loads and utility costs. In addition, Enermodal wanted to optimize natural daylight and improve indoor air quality while increasing employee health and productivity. 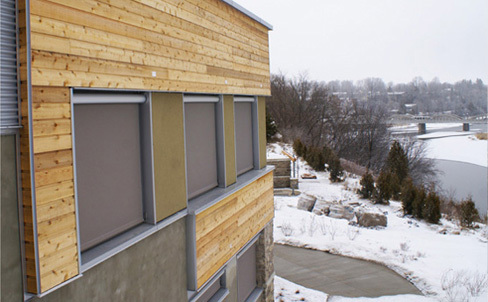 Solution SunProject™ automated FM41 exterior roller sun shading systems were installed on the eastern, western and southern windows to provide superior protection against heat gain. 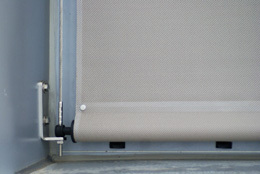 SunProject™ exterior shading system stops up to 90% of heat before it enters the interior space, approximately 60% absorbed by the fabric and 20-30% being reflected. The FM41 system significantly enhances the comfort and well being of the occupant by taking advantage of natural air ventilation, reducing heat and glare, therefore, minimizing the need for air conditioning. The FM41 system helps to provide comfortable, healthy productive sustainable environments. Reinforced fabric edges. Shock absorbers for seismic stability. 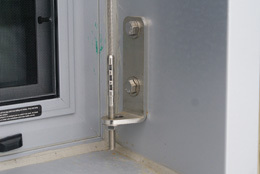 Encased and weather protected in aluminum housing. 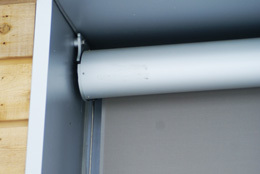 Stainless anchors with wall mounted bracket. 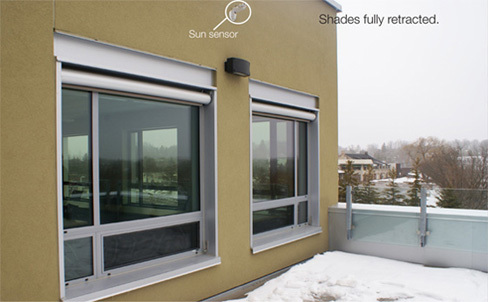 Fully automated shades on a sun sensor will allow for daylight harvesting. When overcast, the shades retract and let natural light in. When sunny, the shades will close and provide solar protection while allowing controlled light into the space. 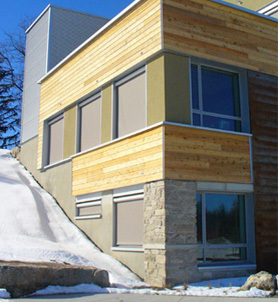 Exterior shading systems protect from unwanted heat gain and glare. Heavy-duty SunProject™ FM41 system is exterior-rated and designed to withstand adverse weather conditions.